The blizzard in Northern NY stopped this afternoon and we had some time to go out and clean up. The sun even came out for a bit! Bee and I took advantage of this to have some fun in the snow. 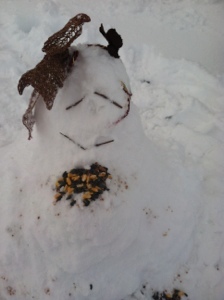 We made a big pile and, inspired by this fun post I found on Pinterest, made a snow girl with an offering of birdseed and corn in her arms. Is the weather super crazy where you are? There are insane pictures of Buffalo all over the news! Thankfully, we didn’t get hit quite as hard as Buffalo did, but we still received a surprising amount of snow over just a couple days in November. It’s very early for us to have this much, and it stalled the area for a few days. Apparently, things will warm up next week and the snow might melt away entirely! Geesh!